Project EverGreen and partners revitalize California park. 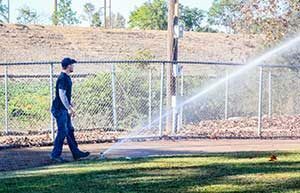 Project EverGreen and Hunter Industries—along with the Southern California Sports Turf Managers Association and other local landscape contractors and suppliers—joined forces to revitalize parts of William Bradley Park in San Marcos, Calif. The playing surface of the park’s Field #3 had become uneven due to the settling of decomposing organic matter—the park was built on a former landfill in the 1960s and was in need of immediate attention. That section of William Bradley Park is used year-round by an estimated 4,000 youth baseball, softball and soccer athletes. The project, which was valued at more than $31,000 in donated time and materials, included the use of biological materials instead of an area of open dirt or hardscape. Click here for a complete list of project contributors.